Saint Irene of Hungary (1088 – 13 August 1134), born Piroska, was a Byzantine empress by marriage to John II Komnenos. She is venerated as a saint. The name Piroska was a Hungarian derivation of the Latin name Prisca, literally meaning 'ancient', but implying 'serious' or 'grave' behaviour. She was a daughter of Ladislaus I of Hungary and Adelaide of Swabia. Her maternal grandparents were Rudolf of Rheinfeld and his second wife Adelheid of Savoy. Adelheid was a daughter of Otto of Savoy and Adelaide of Turin. She was the mother of the future emperor Manuel I Komnenos. She was born in Esztergom. Her mother died in 1090 when Piroska was about two years old. Her father died on 29 July 1095. Ladislaus was succeeded by his nephew Coloman of Hungary who apparently was the new guardian of orphaned Piroska. In an effort to improve relations with Alexios I Komnenos of the Byzantine Empire, Coloman negotiated the marriage of Piroska to John II Komnenos. John II was the eldest son of Alexios I and Irene Doukaina. He was already co-ruler of his father since 1 September 1092 and was expected to succeed him. The negotiations were successful and Piroska married John in 1104. The marriage was recorded by Joannes Zonaras and John Kinnamos. Following her conversion to the Eastern Orthodox Church and settlement in Constantinople, Piroska was renamed Irene. Irene played little part in government, devoting herself to piety and her many children. She was, with her husband, the patron of the construction of the Monastery of Christ Pantokrator (Zeyrek Mosque) in Constantinople. This monastery contained three churches and a hospital of 5 wards, which was open to people of all social classes. Irene died on 13 August 1134 and was later venerated as Saint Irene. Alexios Komnenos (February 1106 – 1142), co-emperor from 1122 to 1142. His birth is recorded in the Alexiad by Anna Komnene. 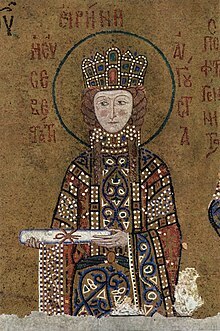 Maria Komnene (twin to Alexios), who married John Roger Dalassenos. Anna Komnene, married Stephen Kontostephanos. Theodora Komnene (died 12 May 1157), who married Manuel Anemas. Eudokia Komnene, who married Theodore Vatatzes. Manuel I Komnenos (died 1180), emperor from 5 April 1143 – 24 September 1180. Wikimedia Commons has media related to Irene of Hungary.